Today, President Hatch will host another Leadership Project event – an initiative to champion leadership development at Wake Forest and bring inspiring stories to students from world-class leaders. 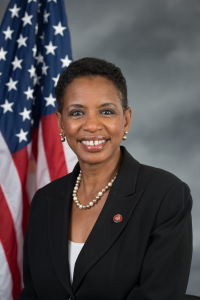 Donna Edwards (’80), former Congresswoman and Wake Forest alumna, is the invited speaker for this semester’s program. Edwards served as the U.S. Representative for Maryland’s 4th congressional district from 2008 to 2017 – the first African American woman to do so. While in Congress, Edwards championed human rights and advocated for criminal justice reform, increased access to quality education in low-resourced communities, and affordable healthcare for all. Earlier in her career, she worked for Lockheed Corporation at the Goddard Flight Space Center and co-founded the National Network to End Domestic Violence, as well as led other non-profit organizations. Edwards is currently on an epic RV road trip promoting awareness of state and national parks. Students, faculty, and staff are invited to take part in two community programs as part of her visit back to campus. The first is an afternoon “Leadership Project Rally” on the lawn in between Johnson and Bostwick Residence Halls from 1:30 PM – 2:30 PM. Hot dogs, burgers, popcorn, snow cones, hot chocolate and coffee are available free of charge as participants have an opportunity to meet Congresswoman Edwards and learn a bit about her experiences. The Office of Sustainability and Outdoor Pursuits will also take part, sharing valuable resources about our state park system and exploring the outdoors. Later in the evening, President Hatch will explore Edwards’ life and philosophy at length as part of a keynote conversation in Farrell Hall’s Broyhill Auditorium at 6 p.m. Attendees will also be invited to ask questions. Through the discussion, President Hatch is hopeful members of the community will take another step in enriching their own approach to leadership. For more information about today’s events, visit lead.wfu.edu.